Salina Central girls basketball coach Chris Fear was concerned about Andover’s three-point shooting. Instead, it was Central’s sharpshooting that did the trick. Senior Selah Merkle poured in a career-high 25 points, Central drilled six threes in the first half, and the Mustangs handled the Trojans, 68-44, securing a spot in the Salina Invitational Tournament championship. Central squares off with Liberal in a rematch of last year’s title game. In the nine-year history of the girls SIT, Central has advanced to the championship contest. Andover (3-7) started the tilt with a triple and forced a slew of Central turnovers. Once everything calmed down, the Mustangs scored the next 11 points, including three consecutive threes by freshmen Hampton Williams and Aubrie Kierscht and junior Kadyn Cobb. Central’s defense also turned Andover over five times in the opening frame, giving Salina Central a 13-7 cushion after one. The three-point party continued for Central (7-3) with Kierscht, Williams and Merkle all hitting from beyond the arc, pushing the margin out to 30-14 at the break. Central hung on to the ball better in the third quarter, suffering from a pair of turnovers. Meanwhile, Andover was plagued by eight miscues, allowing the Mustangs to balloon the advantage out to 47-26 through three quarters. Merkle was the Salina Ortho Player of the Game with 25 points and 10 rebounds. 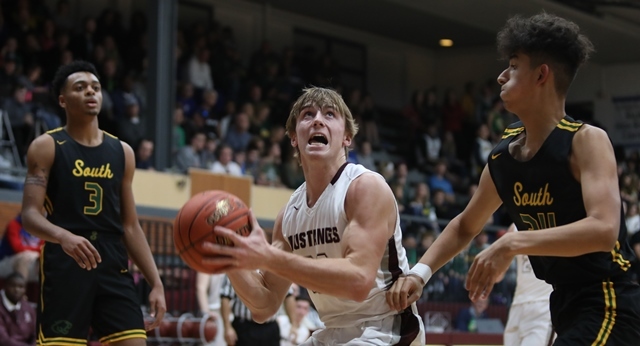 Williams and Kierscht added nine points each for the Mustangs, who challenge top-seeded Liberal at 5:30 on Saturday. Pregame begins at 5:15 on Sports Radio 1150 KSAL. While Merkle put up 25 on the scoreboard in the girls contest, senior Mark Grammer accomplished that feat hours before. Central (8-2) outgunned Wichita South early, getting threes from Grammer and senior Brogen Richardson to give Central an 8-0 start. The Titans battled back to within four, but Grammer connected on two more triples to expand the cushion to 21-10 after one. Wichita South (4-8) crawled back to a 10-point deficit, 28-18, but the Mustangs held on to a 33-19 halftime advantage. The Mustangs ballooned the margin out to 20 with 4:40 to go in the third while limiting the Titans to just four points en route to a blowout victory. Grammer was the Salina Ortho Player of the Game, surpassing his previous high of 24 against Great Bend. Seniors Harper Williams and Ben Driver added nine and eight points, respectively. Salina Central meets Andover in the SIT title game. The Mustangs prevailed last year over the Trojans for their 13th championship. Pregame at 7 on Sports Radio 1150 KSAL.